Create your own light show with the LTS-16 (E 116) Portable Trussing System from Eliminator Lighting. Built out of two 5' I beam sections and two 9' light stands, as well as all the necessary equipment for setup, the LTS-16 will provide a standalone means for creating a truss structure almost anywhere it could be required. The 10' length and 1.5" tube diameter offer versatility and customization in hanging lights, and the system can support up to 50 lb of equipment. 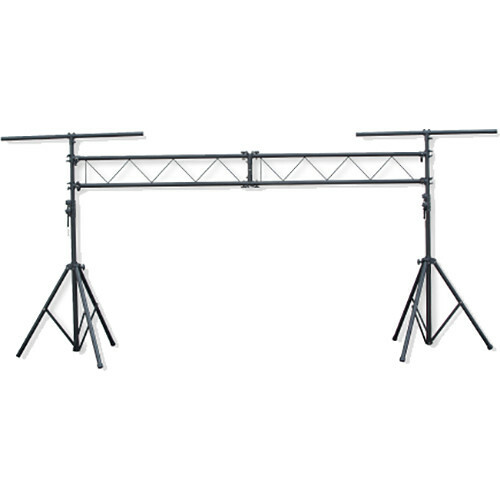 Box Dimensions (LxWxH) 58.0 x 9.0 x 8.0"
LTS-16 (E 116) 10' Portable Trussing System is rated 5.0 out of 5 by 2. Rated 5 out of 5 by Anonymous from HEAVY DUTY for me... I'm just starting on DJ work. I'm making a portable setup that is on a cart that fits into my van. I modifyed this but overall its a great product and is quite sturdy. I'd really recommend it for the price. Also it has alot of adjustability. Rated 5 out of 5 by Nate from Great quality truss at an exceptional bargain This trussing system is replacing one that looks virtually identical. However, this truss has predrilled holes so you can make the truss system a 5ft set up or the 10ft set up which I offer as a DJ. I am very content with my purchase.